Like most DJ’s today, I manage my entire music library from my laptop. Rather than bring a few hundred records with me to a party, I can choose from 30,000 songs at any given moment. The key for me is to stay organized and keep my library in tact. But you don’t have to be a DJ to keep your music organized. Here are some tips to help you get your digital music library in tiptop shape. 1. Tag Tracks. This is the first and most important step to organizing your digital library. The four must have areas to tag are: Name, Artist, Album, and Genre. If you want to get crazy, there are all sorts of other information you can edit such as the year the track was released, composer, comments, etc. The more in-depth you want to go the better, but be careful not to over-extend yourself. The key to this, as with all organization, is consistency. If you’re comfortable with adding years to your tracks, do it. But remember, you will be doing it for every track. 2. Use Ratings. Ratings provide you with a way to prioritize your tracks. It’s simple, the more stars you give a track, the more you like it. The Spaghetti Incident is probably the worst Guns N’ Roses album ever released, but there is at least one song in there I like. Rating tracks individually will help me differentiate between the tracks I like from the ones I don’t. It’s also important for the next step. 4. Create Playlists. Here’s where all your efforts get put to real use. iTunes provides you with the ability to drag and drop tracks to a list and separate them so you can play these tracks later on (hence, a Playlist). Great feature, but the real meat and potatoes is in the Smart Playlist feature. Here, songs can be automatically added to a list based on certain criteria you set. For example, let’s say you want to create a smart playlist that contains all your favorite tracks in your library. Simply create a Smart Playlist with the criteria of “Rating Equals 5 Stars.” Now, every track rated with 5 stars is added to this list. What’s more, is that every new track you assign a 5 star rating to in the future will be automatically added to the list as well. You can create as many playlists as you like. The key of course is having your tracks properly tagged. In my second visit with Cristina Maria we tackled space maximization issues. I took my first trip to Ikea and on a very strict budget and purchased many strategic items that completely TRANSFORMED the look and most important THE FEEL of my home. I could really feel the energy start to shift. Cristina helped me realize that I needed to separate my work area from my relax area and she suggested we do this by diving the living room from my office area using my shelves as “walls” or “dividers”, ingenious yet simple – it ended up looking AMAZING and really creating that separation that now allows me to be more focused and productive while I work, and then shut off completely when I’m done for the day and relaxing. Thank you Cristina for helping me make my apartment a HOME and my SANCTUARY! Stay tuned for the next visit – I’ll be reporting directly from Ikea! Here are the photos of the second consultation after making her first trip to Ikea. If you work in the business world, you surely have receipts, business cards, bills, and other paper documents floating around your office and car, or tucked inside your wallet. All these pesky pieces of paper are critical for tax preparation, surviving IRS audits, and sales or networking, but they are a huge pain to organize and are always easy to lose. Pushing these receipts or contracts through an expensive scanner or manually entering information into spreadsheets is tedious and time-consuming, as is hiring an assistant. And according to PriceWaterhouseCoopers, businesses spend $20 in labor to file a paper document and $120 to find a misfiled document. Enter Shoeboxed.com, a company that transforms receipts, business cards and other paper documents into searchable, organized and useful data. With Shoeboxed, you’ll never waste another minute on scanning and data entry, or lose an important paper document again. Shoeboxed is a robust paper clutter solution that comes with mobile, email and mail-in options to submit documents for processing. After users send documents to Shoeboxed, everything is scanned, data entered and human-verified. The extracted information is then organized and uploaded to the Shoeboxed web application, a secure site where users can access their individual accounts online from any computer. In the account, users can print copies of documents, generate expense reports and export data to QuickBooks, Quicken, Excel, PDF, Outright.com, FreshBooks, Outlook, Address Book, Salesforce and more. Since Shoeboxed is an IRS-accepted electronic storage system, receipts are always tax and audit-ready, and the hard copies can be discarded after processing. Shoeboxed Mobile is great for travelers or any smartphone user. You simply snap a photo of a receipt or a business card on the spot, and forward the image to your unique Mobile email address. The image will be data entered, organized and categorized in your account. For iPhone users an application is available in the iTune store for submitting receipts. Shoeboxed offers a 30 day free trial, so click here to check it out! “Sh*t,” I thought, “That doesn’t reflect a pretty picture of me!” I’ve been in transition this year, and reclaiming my space has been that breath of fresh air I have so desperately needed. I’ve never really been one to put much attention on “making my house a home”, but now that my space was to be SOLELY mine, I wanted it to be a sanctuary for me. As I looked around at my apartment I scanned the energy – dead. The walls were barren, there was no warmth, major clutter , clashing furniture… it was cold and definitely NOT the reflection of me I wanted to see. My space was not conducive to productivity (I wasted SO much time EVERYDAY looking frantically for anything and everything), clarity, creativity, inspiration, you name it. Basically my space was not workflow conscious… And considering I run my business from home that was no good… any (savvy) solopreneur knows that their space MUST be workflow conscious… which opens way to inspired BIG ideas and constant effectiveness. I made a trip to Ikea a few days later with a clear idea about what I needed to get. A few hours later, my apartment was completely transformed into my vision! What was most striking was the shift in energy – you could definitely feel the difference… the air felt light and more clear… I am so grateful to have the chance to work with Cristina, she’s so passionately determined to help people realize the oh-so-frequently overlooked connection between the quality of your mind and the inherent energy that lies in all of the objects we own. Do yourself a favor today and scan your home. Ask yourself – Does my home reflect a side of me I want to see? Here are the photos of the initial consultation prior to procuring anything from Ikea. Stay Tuned for my next Journey Entry #2! As many of you remember my appearance on HGTV “Battle on the Block” this past May 2010. A mini-documentary was done as we, the cast watched ourselves on national TV. It was a total of 4 hours being filmed to gather the best and outstanding moments to create the mini-documentary. Rob Stanford is a talented director and editor who has shot documentaries from Tokyo to London and all points in between. For five years he provided the film making magic at a multinational software corporation. Most recently he directed a commercial featuring NFL Defensive Player of the Year and Dancing with the Stars alumnus, Jason Taylor. Rob’s much-anticipated web comedy series launches in the Fall of 2010. Drop him a line at robfilms@hotmail.com and find out how his digital video awesomeness can help enhance your next project or event. and their reactions on the night of their national TV debut. Check out my interview with Osmara Vindel, Solopreneur Strategist and creator of the “Fearlessly Fabulous” program for women entrepreneurs. Her free e-zine is full of great resources such as articles, books, interviews and much more to help you re-boot your brain, get out of your own way and create a successful business for yourself. Click here: http://www.osmaravindel.com. This isn’t your momma’s coffee shop. Some hip new coffee houses have opened up across South Florida. In tonight’s Style File, 7’s Belkys Nerey shows us this coffee culture. 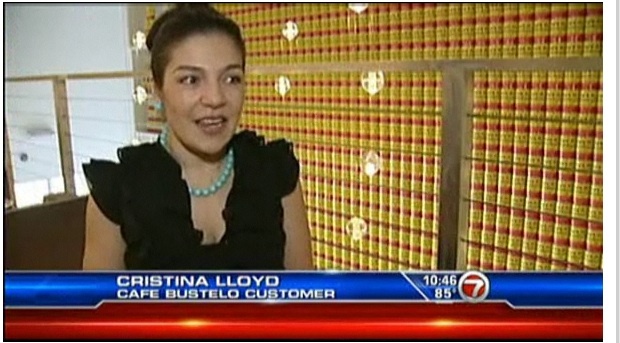 Cafe Bustelo on Collins Avenue in South Beach is also rocking day or night. This locally-owned coffee shop has a cult following in Miami and they take pride in the way they make their coffee. Check it out– Coffee Culture.